How to use Bootstrap Typography? In this article, we will know documentation and examples for bootstrap typography; and we’ll learn many types of elements in Typography including global setting, heading, body text, lists and more. If you have any doubt, ask in the comment section. Typography is the style and advent of headings, simple paragraphs, body text, lists and other inline elements in Bootstrap; It actually contains styles that describe how text elements act. If you want to create a reactive typography which denotes scaling text and components; simply modify the root element’s .font-size within a series of media queries. , sans-serif and many more (font-family) by default. In addition, <body>, <p> (paragraphs) have a bottom margin (by default 10px) and it’s default font-size is 14px, with a line-height of 1.428; and in bootstrap 4, default font-size is 16px with line height 1.5 these all are called global setting or global default. All the headings (h1 to h6) are same styled in Bootstrap like we used in HTML. Bootstrap will style the HTML headings with a braver font-weight and an augmented font-size. It is an outdated heading element designed to work best in the core of your page content; It's more intolerant heading style. Display headings are used for larger font-size and lighter font-weight more than usual headings. There are four different sizes using display heading classes .display-1 to .display-4. In Bootstrap 4 the HTML .small element is used to create a lighter, sub-heading, secondary text by retaining text inside .small element. It specifies a smaller text which is set to approx 85% size of the parent. It will style the HTML .mark element with a yellow background color and some padding for reference purposes, due to its importance in another text. The HTML .abbr element with a dotted border along the bottom provides markup for abbreviations. It reveals the text on hover. We use the <title> attribute to provide an extension of the abbreviation. Note: Here, you can also use the .initialism class to display the text inside an <abbr> element to reduce the abbreviation in a faintly smaller font size. Add the .blockquote class when quoting blocks of content from another source. You can use the default <blockquote> around any HTML text. And there is .blockquote-footer and .blockquote-reverse class used in bootstrap 3. It render <cite> element nested inside the .blockquote or .blockquote-footer element. Note: If you want to create a relative or contextual blockquote then you can use .bq-primary, .bq-danger, .bq-info, .bq-warning, .bq-success, .bq-active class with .blockquote class. It is used to make stand out paragraphs by using .lead class. This .text-left class specifies left-aligned text. It can also align the left text on small, medium, large and extra large screen size (.text-*-left). This .text-right class shows right aligned text. 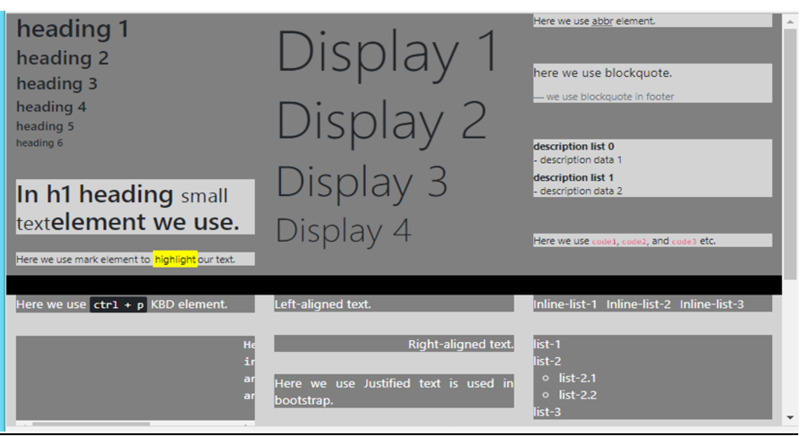 It can also align the right text on small, medium, large and extra large screen size (.text-*-right). This .text-center class directs center aligned text. 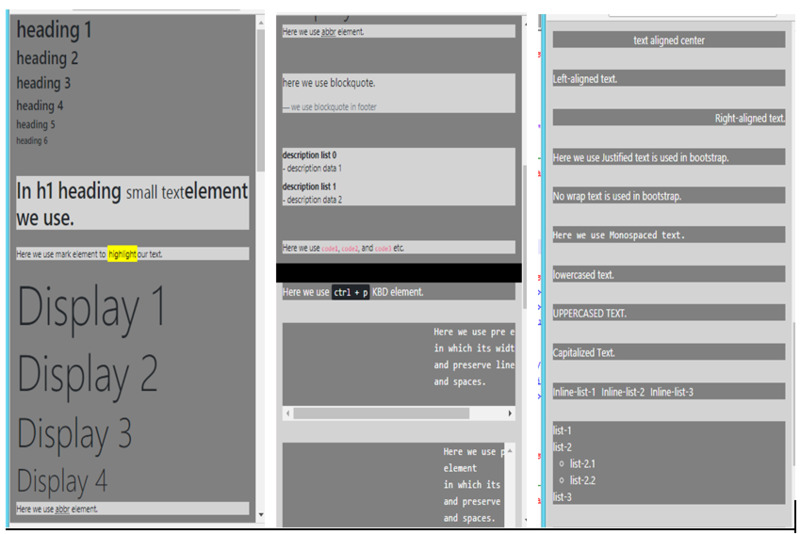 Similarly, It can also associate the center text on small, medium, large and extra large screen size (.text-*-center). .list-unstyled class removes all the default list styles and left margin which works on both the type of list order and unordered list. This .list-inline class is used to display the list item on a single line. .list-inline-item class is used inside the .list-inline class to apply some padding. It has some styling for common inline HTML5 elements. Like: <del> for deleted text , <u> for underlined text , <ins> for inserted text, <strong> for bold or strong text , <em> for italicized text. .pre-scrollable class is used to make a pre element scrollable. Bootstrap allows you to simply set the text background color. You can use contextual classes for text background color (like: .bg-primary, .bg-danger, .bg-warning, .bg-info, .bg-success, .bg-secondary, .bg-dark, .bg-light). In h1 heading <small>small text</small>element we use. Here we use mark element to <mark style="background-color:yellow">highlight</mark>our text. Here we use <abbr title="Abbreviation">abbr</abbr> element. Here we use <code>code1</code>, <code>code2</code>, and <code>code3</code> etc. Here we use <kbd>ctrl + p</kbd> KBD element. Here <samp>not enough memory</samp> in my computer. Here we use Justified text is used in bootstrap. No wrap text is used in bootstrap. Here we use Monospaced text. Here we sued lead element. In this article, we have learned intuitively about typography elements with the example. I hope, now you all know what is typography/text, how it’s important, what are their roles, how and where we can use these elements. In the next article, we will learn more about bootstrap. Stay tuned for the next article. See you in the next Article! Happy Learning!